These days it is easy to become overwhelmed with the choices of puppy food on the market. Walk down the aisle of your local pet store, and you see dozens of brands and food choices all for puppy consumption. Picking the wrong food not only leads to digestive issues but could affect your dog’s development – including bone strength. So, do not haphazardly grab the first bag of kibble you find and let your puppy go to town. Furthermore, remember that puppy food bases nutrition by size (large or small). A small breed puppy cannot eat a large breed puppy feed, because the nutrients used in these products vary significantly. The food you choose your puppy will eat until they are about one-year-old or at least 80 percent of their expected adult size. While you can swap out their food for another, changing puppy food is quite the chore. Picking the right one from the start saves you money and helps your puppy’s development. After carefully analyzing the various brands of puppy feed on the market today, we offer our ratings so that you can narrow down the list of choices and pick the right feed based on your puppy’s breed, size, and your budget. Ingredients: What goes into puppy feed matters. Fillers, by-products, and any artificial ingredients lower the rating of puppy Instead, you want a diet rich in natural foods that are easier to digest. We also look at the order of foods in the ingredients, because the Association of American Feed Control Officials (AAFCO) requires ingredients listed in order of weight. That means the item listed first is the highest volume, while that ingredient listed last has the least dense measurement in the formula. Value: Just because a dog food brand has a high price tag does not mean it is the best. Instead, we looked at the overall value of the product in comparison to the price. Recalls: Food safety is just as important for pets as it is humans. When brands receive multiple recalls throughout the year due to contamination, it calls into question their overall quality. Puppy foods are categorized into small and large breed formula. 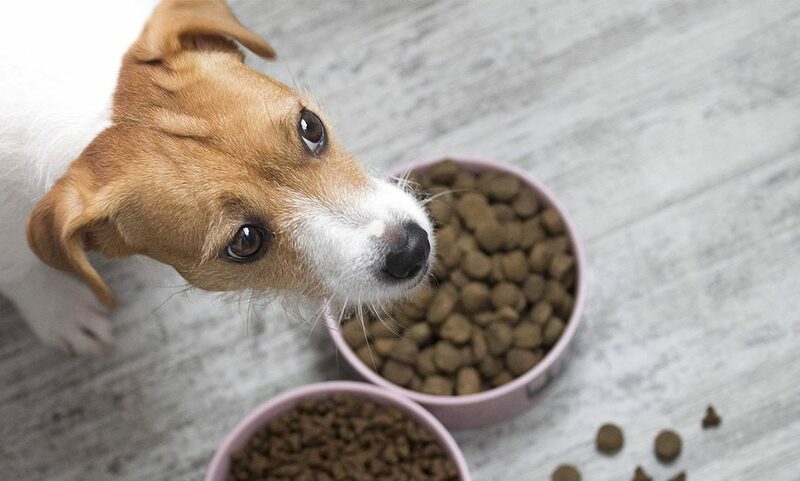 We have compiled a list of the top 10 puppy food brands for both small and large dog breeds, so you can find one that works for your dog. A small breed dog is one that reaches two to 22 pounds at adult age, while a large breed reaches 59 to 98 pounds. If you are not sure how large your puppy will be by adult age, the American Kennel Club offers a breed weight chart for male and female growth. Note that a medium-sized dog is grouped into small for puppy food. Once they reach their adult weight, you can pick food based on their current weight. Wellness has been creating dog food since 1970, and they focus on holistic pet nutrition. Their foods strike a balance between carbohydrates, fats, and proteins, and they avoid fillers or ingredients that may spark allergies in dogs. While on the pricier side, the quality of the food is superior. 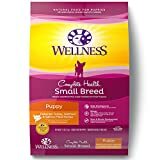 The all-natural blend from Wellness focuses on smaller kibble sizes for puppies and added DHA for healthier brain and eye development. Main Ingredients: Deboned turkey, chicken meal, oatmeal and salmon meal. Other Ingredients to Note: Apples, sweet potatoes, blueberries, carrots, spinach, salmon oil, pea fiber, rye flour, ground brown rice, and ground flaxseed. Protein/Fat/Fiber Ratios: 28% protein, 18% fat, and 4% fiber. Recalls: Wellness has had their share of recalls. 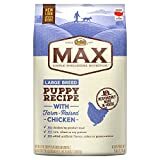 The most recent recalls for their dog food were back in October 2012 when the company reported abnormal levels of moisture in a small breed adult dog food variety. 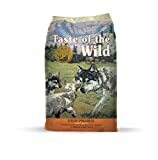 Taste of the Wild is a well-known all-natural dog food brand that focuses on protein-only foods with absolutely no grain fillers. Meats and vegetables combine in this feed to create healthier skin, coats and help puppies diagnosed with allergies. Real fruits and vegetables are added to the blend along with Omega-3 and Omega-6 fatty acids. They also use their proprietary K9 probiotic blend for better digestion. Main Ingredients: Bison, lamb meal, sweet potatoes, and egg. Other Ingredients to Note: Pea protein, tomato pomace, potato fiber, flaxseed, raspberries, blueberries, yucca extract, dried chicory root, and salmon oil. Protein/Fat/Fiber: 28% protein, 17% fat, and 5% fiber. Recalls: Diamond Pet Food owns the Taste of the Wild dog food line, but no recalls of dog food have been recorded. Only the cat food line was recalled in 2013. Blue Buffalo is a popular dog food brand that offers exceptional nutrients without the high price tag. They are notorious for a higher protein ratio in their foods too. Blue Buffalo is a business created by the Bailey family after the loss of their dog, Blue, and is still family run to this day. All Blue Buffalo products feature cold-formed Life Source Bits, which help keep potency of the ingredients. They reduce the amount of heat each ingredient experiences, and the added nutrients ensure eye, brain, teeth, and bone development. Main Ingredients: Deboned chicken, chicken meal, turkey meal and chicken fat. Other Ingredients to Note: Potato, sweet potato, carrot, kelp, parsley, garlic, cranberries, barley grass, turmeric, and caramel. Protein/Fat/Fiber Ratios: 30% protein, 18% fat, and 5% fiber. Recalls: In March 2017, Blue Buffalo voluntarily recalled a lot of their Wilderness Rocky Mountain Recipe, a wet food variety, for potential health risks. 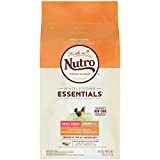 Nutro’s line of natural food products focuses on the dietary needs of a developing puppy. They only use non-GMO chicken and lamb for their primary protein source, and add vegetables and fruits for increased antioxidants. The recipe includes additional vitamins, minerals, and DHA for improved development and growth. Main Ingredients: Chicken, chicken meal, whole brown rice and lamb meal. Other Ingredients to Note: Sweet potato, dried plain beet pulp, split peas, fish oil, blueberries, carrots, and apples. Recalls: The most recent recall for Nutro products involved apple treats in December 2015. The last recall affecting dog food was in September 2009 for plastic found in the production line of the Nutro puppy food brand. 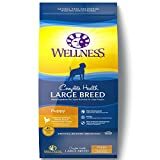 Wellness Complete for large breeds includes chicken and fish protein sources for a shinier, healthier coat. DHA is added for a healthier brain, bone, and eye development – essential for large breed dogs. Main Ingredients: Deboned chicken, whitefish, chicken meal, and salmon meal. Other Ingredients to Note: Sweet potatoes, apples, blueberries, chicory root extract, spinach, flaxseed, tomatoes, barley, oats and tomato pomace. Protein/Fat/Fiber: 24% protein, 13% fat, and 5% fiber. Recalls: The latest recall was October 2012 for higher than usual moisture levels in their dog food line. Nutro Max uses farm-raised chicken as their primary protein source along with whole grains for easier digestion. You might notice higher levels of EPA and DHA on the label, which are essential for brain, bone, and nervous system development in large breed puppies. Main Ingredients: Chicken meal, whole grain oatmeal, and sorghum. Other Ingredients to Note: Chicken fat, peas, flaxseed, chickpeas, whole grain brown rice, fish oil, spearmint extract, rosemary extract, and alfalfa meal. Protein/Fat/Fiber: 26% protein, 14% fat, and 3% fiber. Recalls: The last recall to affect puppy feed from Nutro specifically was in September 2009. Castor & Pollux use free-range protein sources and only organic products. They do not use corn, wheat, soy, or artificial colors. They add Omega-3 fatty acids, and their natural food says it helps dogs with digestive concerns and without. 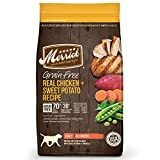 Main Ingredients: Organic chicken, chicken meal, organic peas, and barley. Other Ingredients to Note: Alfalfa meal, coconut oil, flaxseed, blueberries, chicken liver, sunflower seed meal, pea protein, peas, and chickpeas. Protein/Fat/Fiber: 26% protein, 12% fat, and 3.5% fiber. Recalls: The organic food line has never been recalled, but their Natural Ultramix brand had one recall back in 2007. 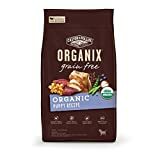 Merrick Grain Free puppy foods feature all-natural, grain-free recipes with protein as the first ingredient. They also incorporate fresh fruits including blueberries and vegetables like peas and sweet potatoes. They add in Omega-6 and Omega-3 fatty acids for healthier coats. Main Ingredients: Deboned chicken, chicken meal, potatoes, peas, sweet potatoes, and chicken fat. Other Ingredients to Note: Flaxseed oil, blueberries, apples, salmon oil, organic alfalfa, and salmon meal. Protein/Fat/Fiber: 28% protein, 12% fat, and 4.5% fiber. Recalls: Merrick Pet Care had a voluntary recall of beef treats, but no recalls for their pet food. 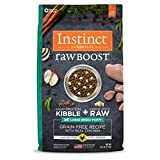 Instinct, created by Nature’s Variety brand, focuses on a high animal-protein diet mixed with vegetables, fruits, and vitamins. They pride themselves on not using byproducts, meal, artificial colors, or grains of any kind. Main Ingredients: Chicken, turkey meal, peas, chickpeas, chicken eggs, herring meal, and chicken fat. Other Ingredients to Note: Chicken liver, tomato pomace, lamb meal, pumpkin seeds, chicken heart, carrots, apples, cranberries, and blueberries. Protein/Fat/Fiber:5% protein, 15.5% fat, and 4.5% fiber. Recalls: Instinct’s raw chicken formula voluntarily recalled after a potential salmonella risk. 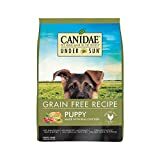 Consider Canidae your farmer-friendly dog food variety packing their meals with everything from pumpkin to butternut squash to single animal proteins. They use grain-free recipes, but never blend animal proteins – which they claim reduces sensitivity. Main Ingredients: Chicken meal, yellow peas, green peas, garbanzo beans, chicken fat, and chicken. Other Ingredients to Note: Butternut squash, carrots, green beans, pumpkin, blueberries, and alfalfa. Protein/Fat/Fiber: 28% protein, 11% fat, and 5% fiber. Recalls: Diamond Pet Foods owns Canidae, and dog food products were recalled voluntarily in 2012 due to potential salmonella contamination. The food you select for your puppy needs a balance of fat, protein, vitamins, and minerals to help them grow. The recommended protein for a puppy is 22 to 32 percent, while they need a minimum of 10 to 25 percent of fat. Also, your puppy doesn’t need a high-calorie diet. Instead, VCA Hospitals recommends food with less than 350 calories per cup. Look for Easily Digested Forms of Fiber: Your puppy does not need a high-carbohydrate diet, but fiber is essential for energy. Look for whole grains like brown rice. Identifiable Animal Proteins: Food should have identifiable animal-source proteins such as chicken, lamb, fish, or beef. Fats from a Labeled Source: Be cautious about the fats in your puppy food. Only choose ones that are healthy fatty acids, like Omega-3 and Omega-6. Check the source of those fats and avoid foods that do not use chicken fat or safflower oil. Fruits and Vegetables: Like a growing child, puppies need balanced diets – including fruits and vegetables. Vegetables and fruits have nutrients, minerals, and antioxidants necessary for healthy growth. Look for brands that use real fruit, like apples and blueberries or vegetables like squash, spinach, or carrot. Amino Acids: Protein is not the sole source of amino acids; instead, you should see arginine, isoleucine, methionine, valine, or tryptophan sources too. If you’re concerned that the puppy food you picked is making your dog sick, or they seem to have digestive troubles, consult with your veterinarian. Some dogs may require special diets, and only your veterinarian can diagnose these conditions. 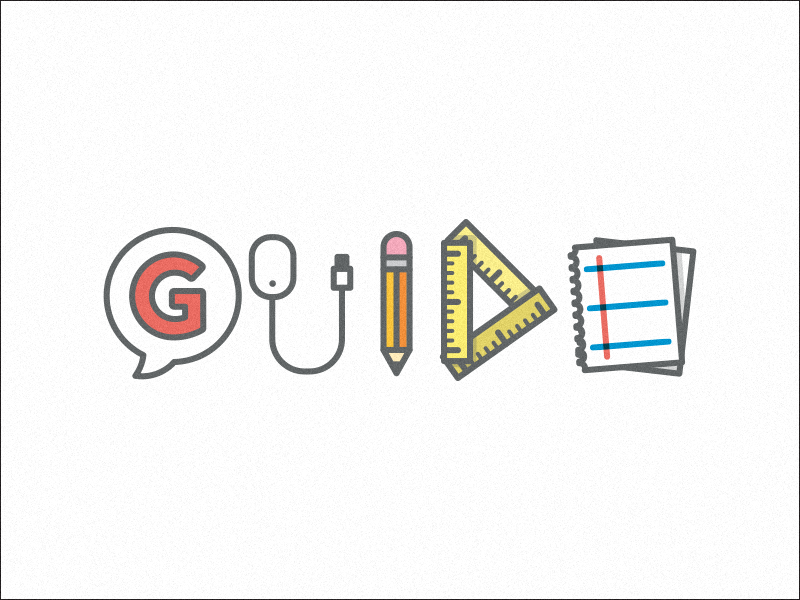 For more insight on products you and your pets will love, check out our reviews or give your fur baby something extra special by trying one of our DIY pet-friendly recipes.